The Wear introduces listeners to the Straw Dogs’ latest effort, No Dividing Line. This soft, alternative take on rock is led by an emotive and alluring set of vocals. The lush arrangements laid down by the drums and guitars make for a track that will stick with listeners long after it ends. High Horses speeds things up, inserting a Tom Petty meets Soul Asylum feel into the mix. No Dividing Line is an album that stays strong, with the mid-point showcasing a band that is continually changing and clarifying their style. Already Told Me is a tremendously impacting song, as the vocals soar on a set of instrumentation that is continually shifting and changing. Borrowed Troubles slows things up considerably, allowing listeners to hear a different side to the Straw Dogs. Hints of sixties rock and psychedelia can be heard even as the guitars throw down some country-esque riffs. Hey My Love keeps things tender with a soulful instrumentation and vocals that seem at place on a Counting Crows or Da Vinci’s Notebook track. The track is pushed to an entirely higher plateau with the inclusion of a horn; the Straw Dogs break free of any genre constraint in their creation of No Dividing Line. Goodnight completes the Straw Dogs’ latest, and it has a more diffuse and fuzzy feel than other tracks on this album. 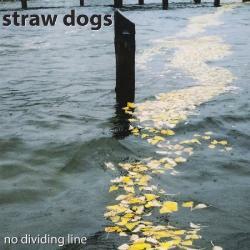 No Dividing Line can be purchased at the Straw Dogs’ website (http://www.strawdogs.com/) or their CDBaby (http://www.cdbaby.com/Artist/StrawDogs). For those that are looking for a distinctive yet familiar band, the Straw Dogs create tremendously effecting music with each subsequent effort on No Dividing Line.